How can anyone argue with funny, food fight, and kiteboarding? Calvin lives with his first grade sister, Darci, and his mom in a town called Kailua on the island of Oahu. Soon, however, Stella is coming to live with them. Stella is fifteen, from Texas, and the daughter of Mrs. Coconut’s best friend from high school. She’ll be sort of a big sister, says Mom, a babysitter. Calvin has to move into the garage storage area with the giant centipedes (which are kind of cool, he admits) to give Stella her own room. That can only mean more trouble for Calvin. He’s a kid who accidentally goes kiteboarding with a kite and no board. He draws the attention of Tito, the school bully. His captured centipede (I told you they were cool) escapes in the fourth grade classroom. Mr. Purdy makes him the classroom greeter for the month which means shaking hands with everyone…even girls! And his forgetfulness locks Stella in her room on her first morning in Hawaii. See? Calvin Coconut: Trouble Magnet. Reading realistic fiction invariably brings to mind two questions. One: Could I live there? Two: Could I teach there? Calvin lives a couple blocks from the beach, across from his house is a jungle, and “high above the jungle, green mountains sat under hats of white clouds.” Yep. I could get used to that. Culturally, however, would be another story. Willy, a new kid and the only haole, or white kid, in the class, doesn’t know what cuttlefish is, but he bravely tastes it. He doesn’t know what kimchee is, but he tries that too, with shocking results. Kimchee flies. Macaroni flies. More kimchee flies. Something gooey hits Calvin. Chaos ensues, all because the new kid didn’t know that kimchee is pickled cabbage and chili peppers. The setting would be great, but culturally? I’m sure I’d learn (as readers do), but let’s just say that, as the new guy in town and in class, I’d probably cause my share of food fights. Calvin Coconut and author Graham Salisbury bring the Hawaiian Islands’ culture and setting to kids on the mainland. But despite any differences, readers will quickly realize that kids are kids, school is school, funny is funny, and maybe most importantly, trouble is trouble. If a girl’s gotta think – and this girl, Gooney Bird Greene, certainly does some thinking – then she’s gotta keep her brain warm. And if that girl wears two pony tails, then that girl needs a two-ponytail hat. Of course. Perfectly logical. So what has a circular elastic band, two holes perfect for ponytails, and sometimes comes in pale green with ruffles? Soon enough, the talented Mrs. Pidgeon leads the discussion away from Gooney Bird’s brain warming hat and on to poetry, using a possible snow day as its subject. The anticipated snow day does not come, but more lessons in poetry do. (As do a variety of brain warming hats throughout the class.) Students learn about haiku, couplets, and limericks. The once-mysterious Mrs. X also returns, but not in person. Mrs. Pidgeon shares her mother’s poetry. She also shares stories of her mother’s failing health with Gooney Bird and her classmates. In the end it’s Mrs. X’s health and the class’s love for their teacher that inspires Gooney Bird and the rest of the second graders to create their biggest masterpiece: A poem for many voices written, performed, and videotaped by the class. Lois Lowry's fourth book featuring Gooney Bird is another winner. Sometimes these second graders appear to have wisdom and education well beyond average students their age, but these well-crafted characters are enjoyable nevertheless. Gooney Bird is So Absurd joins Gooney Bird Green, Gooney Bird and the Room Mother, and Gooney The Fabulous as another excellent book to put in the hands of second, third, and fourth graders. Carolina Collins is the youngest of the four Collins children, or “them loud-mouthed Collins gals” as the locals sometimes say. Fourteen year old Kentucky is the popular one. Twelve year old Virginia is the pretty one. Eleven year old Georgia is the smart one. But ten year old Carolina? She says she’s nobody at all. Sometimes with all the praising and bragging on her sisters, it can be hard to have many compliments left over. Whatever they do, they do it loud, and readers understand right from the start. The girls and their mother, Serilda, are off to get permanent waves in their hair – one $ each Sat morn come early – and despite the five dollars already spent on their perms, the girls persuade Mom to go see Rebel Without a Cause. When they return home, favorite cousin Tadpole is on the porch with his guitar singing with some neighbors, waiting. “Well here we are!” he exclaims. Tadpole (now simply Tad since he’s getting older), who has bounced around between family members after his parents died, has come for a visit. At thirteen he’s been adopted by his Uncle Matthew and Aunt Lucy Birch. Serilda believes it’s simply because he’s now old enough to work. Turns out she’s right, and soon more truth is revealed. Uncle Matthew beats Tad when the boy doesn’t meet his standards. Which is often. Tad’s not just there for a visit. He’s there to escape. But while he’s visiting, everyone is going to enjoy it. Tad acts in ways foreign to those Collins gals. He weeds the garden and picks vegetables without being asked. Then he cans them! Without Mama! He organizes a Fourth of July picnic for everyone. He gets small jobs in Polly’s Fork to help with the bills. He also sings and gets Carolina to sing with him. She can hear the layers in music – harmony, he explains – and tries her best to join him. But the good times don’t last forever. After writing letters to family members asking them to help (none come forward) and a couple close calls when Uncle Matthew showed up at the house, Tad can’t hide anymore. Uncle Matthew Birch takes him back. But will Tad stay? Will he return for his guitar which he left in Carolina’s care? Will Uncle Matthew change? After all, Tad’s influence on the Collins family lasts long after he leaves. Can he affect Uncle Matthew? Normally, I don’t recommend books featuring abused children, but for some reason, this one is different. Maybe it’s all the colorful characters. Maybe it’s just Tad, a boy mature for his age, full of hope and spirit and determination. Maybe it’s the opportunity to introduce bluegrass music and Bill Monroe to 21st Century kids or Ruth White's ability to write in a distinctly Appalachian dialect. Whatever it is, it works. Tadpole has never failed as read aloud in my class, and it was voted a mock-Newbery Honor book at our school in 2004. Emily and Navin are moving. Unable to afford their home after her husband’s death, Karen has decided to move the family to a house that has been in the family for years. Unused and filthy, but paid for. In their cleaning attack, the kids end up in Great-Grandpa Silas’s library. Emily and Navin discover books and portraits and all variety of gadgets and inventions. Most importantly, Emily discovers an amulet necklace that attaches itself around her neck. Someone…or something…in the library, however, also discovers them. A ghostly phantom escapes a heating duct. A shadowy creature observes the family’s activities. That night, their first in the new house, the amulet awakens Emily and gives her a message. “Emily. Listen carefully. Your family is in danger. Stay with them. Keep them safe.” Safe from what, Emily wonders, but the amulet is silent once again. Later that night, mysterious noises draw the family’s attention. Mom is quick to investigate the origin in the basement, ordering the kids to stay upstairs. Emily obeys her mother, disregarding the amulet’s warning. Following her screams through a basement door, Emily and Navin find themselves in an alternate Earth, a world of odd creatures, and odd family secrets, including what happened to Great-Grandpa Silas. They meet Miskit, Ruby, Cogsley, and Morrie – a pink rabbit, vacuum cleaner (I think), and two robots, respectively. They also discover that Great-Grandpa Silas had somehow selected Emily to continue his work. She must choose: accept the amulet/stone and it’s power/risks/abilities/dangers, the chance to rescue her mother, and even the possibility of turning back time or simply turn it away. The Stonekeeper begins with a prologue of the night Emily’s father died two years earlier. 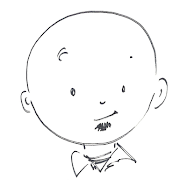 It is a brief account, but readers immediately feel the power of Kazu Kibuishi’s art. As the family drives to pick up Navin, there is an accident. The car crashes through a guard rail, flips, and slides down a steep, snowy embankment. It comes to rest against a tree on the edge of a cliff. Emily and her mother get out, but David’s legs are trapped under the dashboard. The car begins to slide, the tree gives way, and a husband and father is lost. Immediately the prologue illustrates so clearly how graphic novels can quickly show what takes pages to describe in a traditional novel. Seeing David’s hand slowly slip out of Karen’s as the car shifts. Seeing Emily’s feet rise off the ground as she tries unsuccessfully to hold the tipping car down by its front bumper. Readers immediately know the desperation and heartbreak felt by the family. Kibuishi’s art continues to hold readers’ attention throughout this action packed book. Luke lives in the attic. Mostly, anyways. He’s an illegal third child. After having Matthew and Mark, his older brothers, his parents decided they wanted another child. This “no third child” foolishness the government recently enacted surely won’t last, they thought. A baby could be hidden for a short time until more logical minds prevailed and the law was repealed. Now, twelve years later, the law is still in place, and Luke remains Among the Hidden. He eats meals with his family, but he doesn’t attend school, go to town, or visit the neighbors. Nothing. The remoteness of the family farm allows him some outdoor freedom – fields, barn, backyard – but that’s it. Now the government has cleared the forest behind the house to make room for new housing. Unfortunately for Luke, the shelter given him by the forest has now disappeared along with the trees. Most days are spent in the attic. Someone could see him through the windows. The government could monitor the phone, computer, or the family’s daytime electricity consumption and send the Population Police to investigate. Anything might give him away. Luke’s only break from the monotony is his view of the new houses through an attic vent. One boring day blends with the next for Luke as he watches the comings and goings of the neighboring Barons, the rich upper class residents of his community. Then Luke sees the last thing he expects – a face peering out of the neighbor’s window. From an empty house. Empty just like his. Daring to venture out, despite the danger of discovery and his parents’ constant warnings, Luke goes next door. He meets Jen, another third child, daughter of a Baron, with a dream of being a great reformer. She is convinced the government’s stories of overpopulation are all lies. Through Internet chat rooms she is organizing a rally of shadow children, a rally to bring attention to the thousands of children that live in secret without the freedom other children enjoy. She believes the laws banning third children will be eliminated due to her efforts, and she wants Luke to help. Will he? Can he? Should he? All are questions Luke must weigh, knowing the consequences could be severe. Jen’s decision is made, and Luke makes his. The end of the book – after the rally of shadow children – finds Luke assuming a new identity and leaving to live Among the Imposters, the title of the second book in the seven book Shadow Children series by Margaret Peterson Haddix. Question: Is it possible to get 1. Randolph Caldecott, 2. Burl Ives, and 3. Bob Dylan to all fit cohesively into one book review? Answer: Certainly, if you choose the right book. Every father needs to provide for his family - the wife and young 'uns, so to speak. Even a fox. So when the fox goes out on a chilly night he goes where many foxes would. A farm. The sly fox sneaks his way into the farmer's bin, swipes a duck and the grey goose, and swiftly heads back to his den. "And he didn't mind the quack, quack, quack, or their legs all dangling down-o, down-o, down-o." Old Mother Giggle-Gaggle realizes what's happening, however, and declares, "John! John! Our grey goose is gone, and the fox is on the town-o, town-o, town-o!" Farmer John rushes out in pursuit, blowing his horn as a warning, his rifle in tow. Fortunately (or unfortunately, depending on who you're cheering for) the fox makes it back to his wife and ten little ones. "They never ate such a dinner in their life and the little ones chewed on the bones-o, bones-o, bones-o." The illustrations alternate between color and black and white and there are tons of tiny details to notice with each reading. There is a Civil War monument with Giggle-Gaggle, the farmer's family name, listed on the side. Several pages later readers see a framed photograph of a Civil War soldier on the farmer's bedroom wall. There are Giggle-Gaggles on tombstones in the cemetery. As the fox makes his way to town-o, careful readers will see hints of where his quest will take him by looking at locations in the distance. 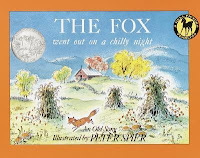 The Fox Went Out on a Chilly Night by Peter Spier was awarded a Caldecott Honor in 1962. Young readers will like it well enough, especially the fox racing back home while carrying his plunder and the farmer throwing on his britches over his nightclothes, but it's an absolute riot trying to follow along as the song plays. (Not the Burl Ives version, mind you. The Nickel Creek version. See below.) As with most traditional folk songs, lyrics change and verses get dropped, but the song I first heard, the song my kids loved singing “town-o, town-o, town-ooooooo,” matches the book pretty well. So that’s it. 1. The book won a Randolph Caldecott Honor. 2. The story is a traditional folk song once recorded by Burl Ives. 3. The song was also recorded by Nickel Creek who, when performing the song live, often include the first verse of Subterranean Homesick Blues by…Bob Dylan. "It's a bit over the top, don't you think?" my wife asked after we'd both read The Mostly True Adventures of Homer P. Figg. "Yeah, it is, but don't you think kids will love it? It's just one adventure into the next," I responded. We both thought for a moment, then realized at nearly the same moment, of course it's over the top. This is Homer P. Figg telling the story here, and if readers learn anything, it's that lying comes to Homer like buzzing comes to bees. This is the boy who warns readers at the beginning of chapter one, "Telling the truth don't come easy to me, but I will try, even if old Truth ain't nearly as useful as a fib sometimes." Homer and his brother, Harold, live with their uncle, Squinton Leach, who believes the boys are to him as Boils and Pestilence are to Job in the Bible. Simply put, old Squint ain't happy unless he ain't happy, and by simply living, the boys do plenty to make sure Squint ain't happy. When Squint catches Homer eating a bread crust intended for the pigs, Harold stands up for his brother. Enraged, Squint leaves the farm and returns with local officials. He swears that Harold is 20 (he's really 17) and sells him into service in the Union Army for $200. Homer can't stand the prospect of losing his brother so he runs away, a fibber trying to find his brother and convince others of the truth. Harold meets a cast of characters, each more dastardly or noble or pious than the next. There's Stink Mullins and Ebenezer Smelt, slave catchers willing to return free men for the reward. Next Homer meets Jebediah Brewster, a big, bold Quaker aiding runaway slaves on the Underground Railroad. There's bumbling preacher-to-be Webster B. Willow, swindling shysters Kate and Frank Nibbly, and the proprietor of a traveling medicine show, Fenton J. Fleabottom, Professor. Homer's quest leads him from his home in Pine Swamp, Maine to New York, into New Jersey, and finally to Pennsylvania. He eventually does catch up with Harold, but the truth he discovers about war is different from what he expects. Author Rodman Philbrick brings Homer's mostly true adventures to a close by showing how Homer and Harold played a role in one of the most famous battles of the Civil War and, quite possibly, changed the course of United States history. And that's the truth. Mostly, anyway.